Fire up your grill one more time before it gets too cold–Smoky charred grill marks are for more than just summer burger cookouts! When I was grilling the polenta and eggplant for this dinner a few nights ago, our neighbor’s dog wandered over. “Oh, sorry! He’s just sniffing around for any hot dog remains!” My neighbor called out. “Well, he’ll have to keep on looking!” I called back. Poor little dog, we didn’t have any hot dogs or leftovers to share from this delicious meal! I don’t think you will, either, after this pairing: Creamy polenta grilled crispy, smoky, and charred; grilled egg plant, rich and mellow; chunky citrus Mediterranean tapenade, briny and lemony–definitely a combination worth devouring entirely (and not throwing into a plastic container to reheat in the microwave the next day for lunch). I use a charcoal grill, so it takes about 30 minutes to get the coals to the optimum heat. So that’s a simple multi-tasking solution: while the coals are doing their thing, slice the eggplant and sprinkle with salt and place in a colander to drain for about 30 minutes. Sprinkling with salt and letting the extra liquid drain takes care of any bitterness the eggplant inherently has. After draining, lay on a paper towel and dab away the extra liquid before putting on the grill. While the eggplant is draining, roughly chop your tapenade ingredients. A tapenade usually consists of very finely chopped or pureed olives, capers, and anchovies. With my chunky-citrusy-parsley-tomato-olive-artichoke-hearts-roasted-red-pepper-and-no-anchovy mix, I guess I’m loosely interpreting my “tapenade” topper, but it works. 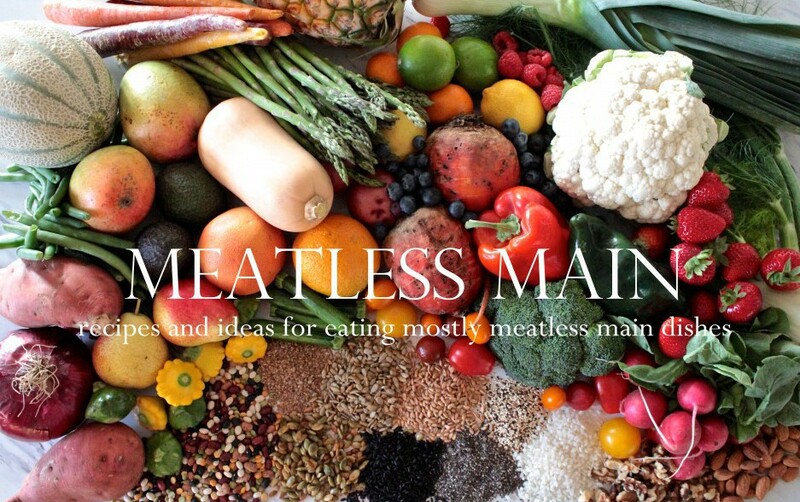 Once everything is stirred together and grilled up, sit down at your favorite picnic table and enjoy! 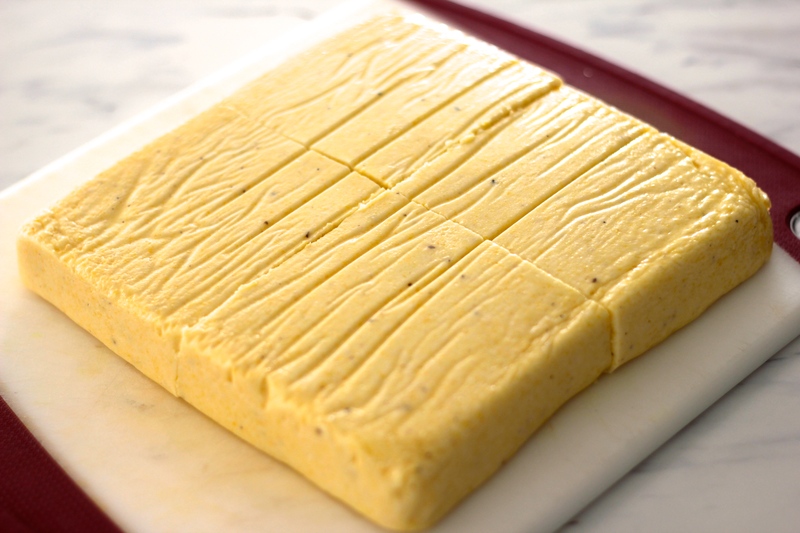 Grease an 8×8 square cake pan and line with a strip of parchment paper, 4-5″ in width and 12-15″ in length (this will help you pull out the polenta when it’s cooled). For the polenta, heat three cups of water to boiling in a medium pot. While waiting for the water to boil, stir together 1 cup of polenta and 1 cup of half and half (or water) and 1 tsp salt and 1/2 tsp pepper. When the water is boiling, whisk int he polenta/half and half mixture and immediately turn the heat down to low. Over the next 20-30 minutes, continuously whisk the polenta and add water, half a cup at a time (similar to risotto), until it pulls away from the sides of the pot. It seems like the polenta will be done cooking within 5-10 minutes, but the texture totally changes to be super creamy if you take the extra time. Turn off the heat and add the butter and parmesan cheese (or yeast flakes). Pour into the prepared cake pan, cover with saran wrap (so a skin won’t form on top), and let cool, at least one hour. Prepare your grill if you are using an outdoor grill that needs time to heat up. If you are using a small pan grill, you can heat that up after preparing the tapenade ingredients. 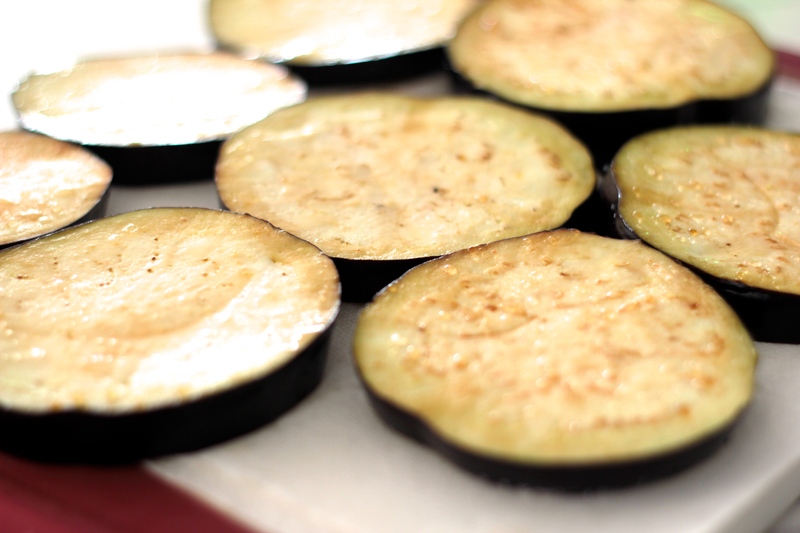 Prepare the eggplant slices by sprinkling generously with salt and setting in a colander in a clean sink. Let them drain any extra liquid for 20-30 minutes. Remove from colander and place on a work surface covered with a couple layers of paper towels. Dab with more paper towels to remove extra moisture on top. 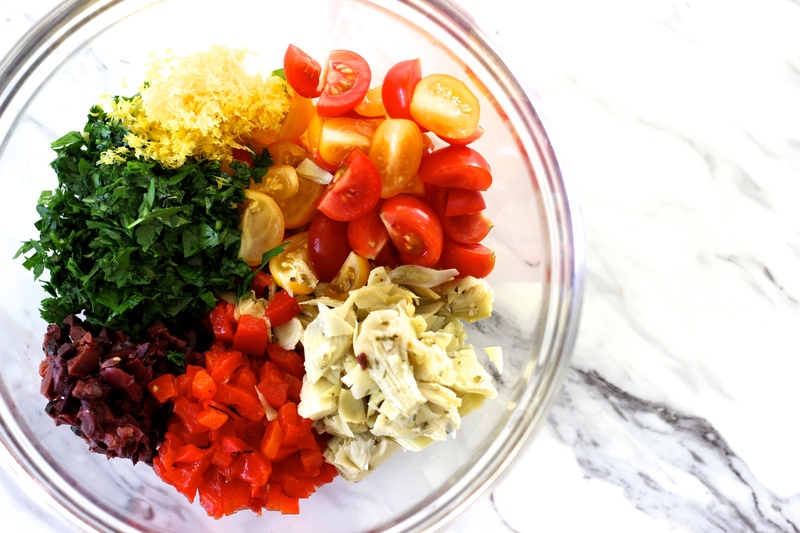 Add all the tapenade ingredients (the marinated artichoke hearts through the lemon zest and juice) in a large bowl, also add salt and pepper to taste. 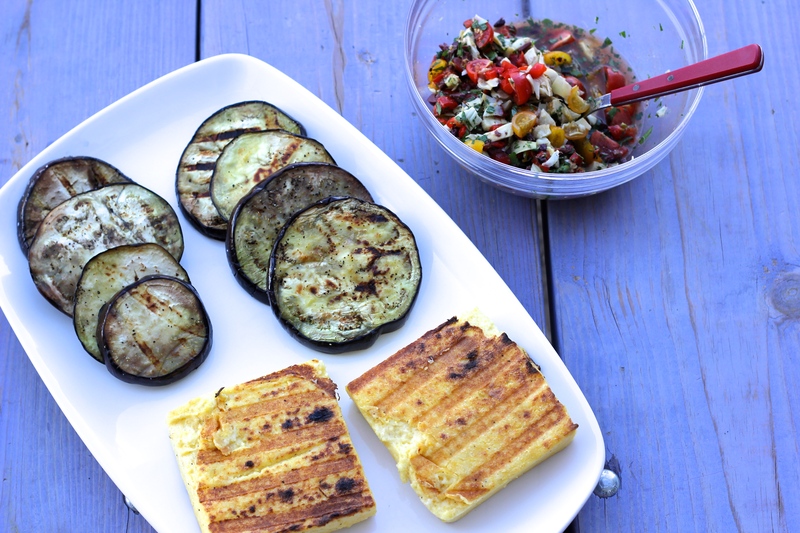 Prepare the polenta and eggplant to go on the grill. Pull the polenta out of the pan and place on a cutting board. Cut into four large squares (even if you are going to cut smaller later for smaller portions, it’ll be easier to have large squares on the grill), and oil well so it won’t stick on the grill. Place eggplant rounds on a large plate, oil liberally and sprinkle with salt and pepper. 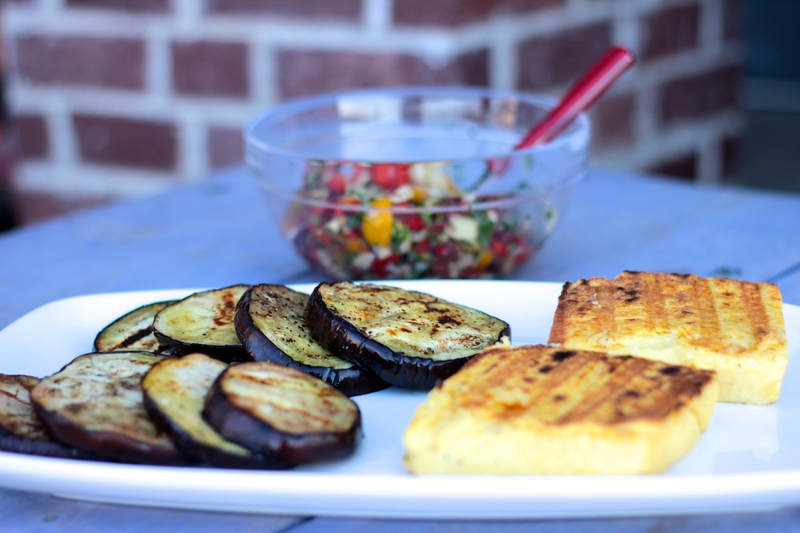 If you have enough room, grill the polenta and eggplant at the same time until golden on one side, flip, and grill the other side until golden. 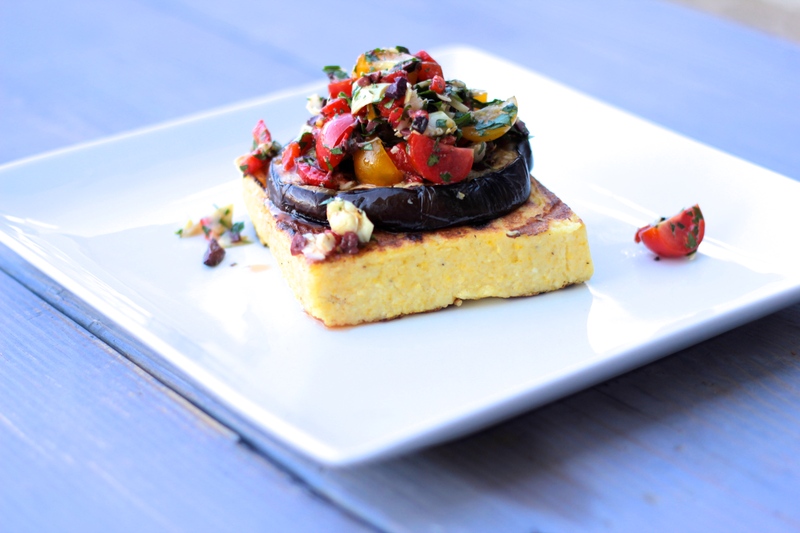 To serve, stack polenta square, eggplant round, then a few spoonfuls of the tapenade. If you are cutting the squares into smaller portions, cut the eggplant rounds into fourths. 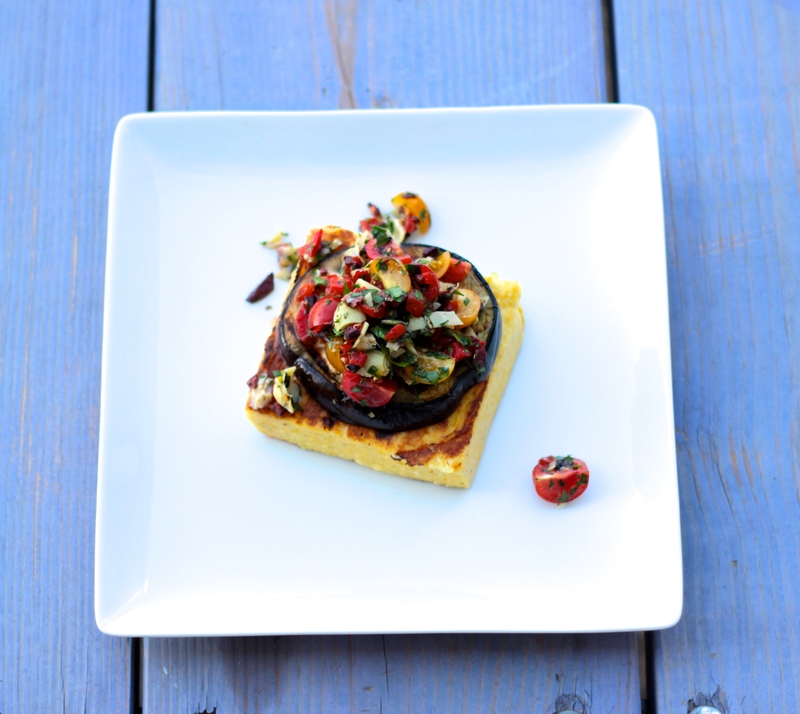 Grilled polenta may be the best thing I’ve ever tasted.